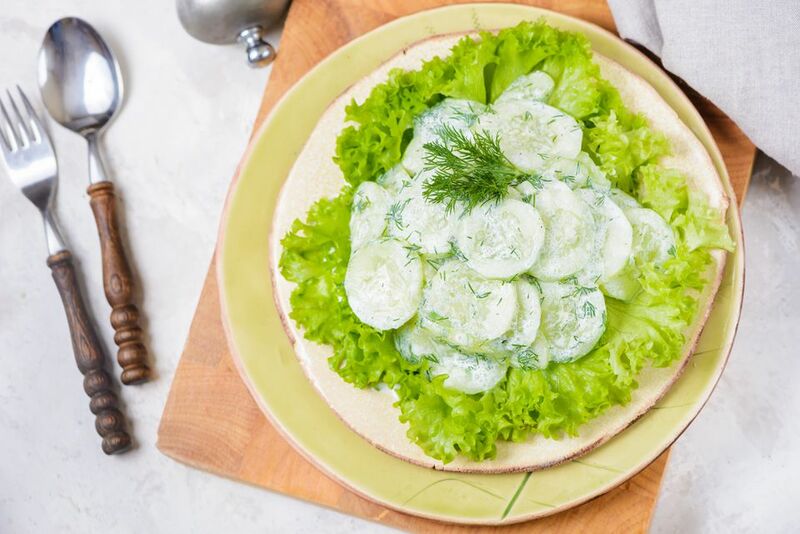 This recipe for a simple summer side dish is made with cucumber slices that have been marinated in salt, drained, and mixed with a dressing of sour cream, vinegar, and dill. It comes together in about 10 minutes plus a few hours for marinating and another hour for chilling, but the active work time is negligible. It can be done in steps with time in between for a dip in the pool. If you're lucky enough to have cucumbers fresh from your garden, CSA, or local farmer's market, go ahead and leave the peels on. Otherwise, peel them because they might have been sprayed with pesticides or other harmful chemicals. Serve the cucumbers as is or on mixed greens, watercress, or chopped lettuce for a refreshing and tasty side dish that is excellent with a summer meal. Arrange cucumber slices in a serving bowl, sprinkling layers with salt. Place a saucer or other weight on cucumbers to weigh down. Cover and let stand for several hours. Pour off and discard the excess cucumber juices. In a small bowl, whisk together sour cream, vinegar, and chopped dill. Taste and add freshly ground black pepper. Add the dressing to the cucumbers and gently toss to coat them. Chill for at least 1 hour and stir to re-blend the ingredients before serving. Pair with your favorite entrée and enjoy! For a faster and lighter cucumber salad, omit the sour cream and toss the sliced, marinated, and drained cucumbers with a mixture of 1/3 cup of cider vinegar, 1/4 cup of water, 2 tablespoons of sugar, and up to 1/2 teaspoon of salt if needed. Add the chopped fresh dill and freshly ground black pepper to taste. Theoretically, any cucumber can be used to make this dish, but the most frequently used types are the slicing and "burpless" varieties. Slicing cucumbers are your garden-variety cukes found in most grocery stores. They have tough, dark green skin that is usually waxed and seeds that can range from very small to very large. To avoid any bitter taste, they should be peeled and large seeds scooped out. Common varieties include Kirby and Persian. Burpless cucumbers are also known as English cucumbers. They are longer and narrower than slicers and their seeds are usually so tiny, they don't have to be removed. The skin is thin and edible and, in general, are sweeter-tasting than a slicer, although some would argue they are flavorless. They get their name from the fact that people believe it's the seeds in cucumbers that cause burping. Therefore, the negligible seed presence in English cukes should cause fewer burps and be "burpless." But the jury is still out on this one.